Giving back, supporting local community efforts, helping people in need- these are fundamental values for us. A series of violent tornadoes ripped through Raleigh and across the heart of North Carolina on April 9, 2011. The storms leveled or damaged hundreds of homes, demolished a trailer park, plucked trees out of the earth and left more than 84,000 people without power. After the tornado, Ben Kelley decided to help out at a trailer park, which had approximately 100 trailers in it before the storm hit. 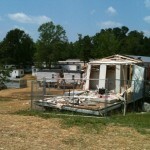 He drove to North Carolina to volunteer where he and his team were assigned to repair trailers in a mobile home park. The Martha’s Vineyard Youth Leadership Initiative’s (MVYLI) mission is to train the next generation of Island leaders to build a more sustainable world. Their year-round programs provide Vineyard youth with tools, training and leadership development opportunities. We did some volunteer work on their administration building. Ben Kelley was a board member and VP at Friends of Family Planning for 7 years. Our mission was to support accessible healthcare for our island community. For several years Ben was on the board for Whippoorwill Farm, a Community Based Agriculture (CSA) farm producing local, organic food, connecting the community with their farmers. Big Brothers Big Sisters- Start Something Big. Ben was a big brother to his little bro Skylar for nearly 7 years. It's a great way to learn and give. We support the Vineyard House. Vineyard House provides housing for Island men and women in need of a safe structured living environment while they are in the early stages of recovery from alcohol and drug addiction. When it was in Edgartown, Ben volunteered walking dogs and cleaning kennels at the MSPCA.